Recipe by Naiya Sheth: Must be surprised! Pizza and nachos together? But it is possible. It's a fusion recipe with the combination of nachos and pizza. Actually I wanted to make it easy and quick serving recipe so that it can be served as starter and in kids party also. But I did not want to use crispies or cookies. I wanted to make something different. And it came out very nicely. 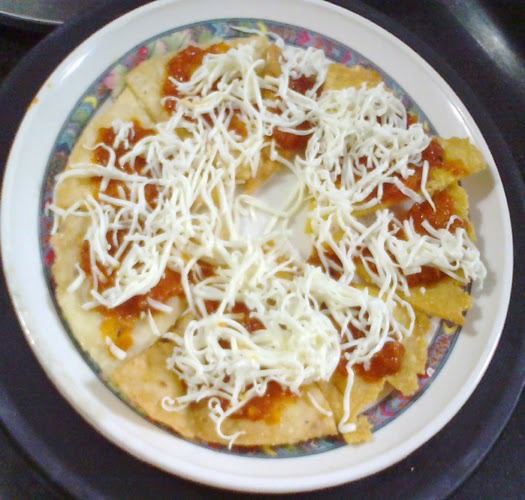 So try this delicious home made recipe of Nachos Pizza. Mix all ingredients of yellow nachos and knead hard dough from it. Keep aside for 10 minutes covered. Make equal balls from it and roll thin. Cut in triangle shape and prick. Fry in hot oil at slow flame till crisp. Repeat the same for white one. Place nacho chips in serving plate and spread some pizza sauce over it. Cover with grated cheese. That's it delicious and crispy Nachos Pizza is ready to serve.